Asthma affects more than 34 million people in the United States, and is one of the most common long-term diseases of children. Asthma symptoms, such as coughing, wheezing, and chest tightness, can be aggravated by triggers that are often found in our homes. The way we clean our homes and the types of cleaners we use may actually exacerbate asthma symptoms. 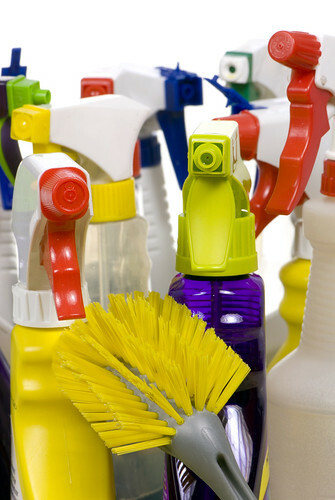 Many common household cleaners contain hazardous chemicals that can trigger an asthma attack. Instead, use “green” and “environmentally-friendly” cleaners that are derived from plants to clean your home. Homemade cleaners using ingredients such as baking soda, vinegar, and lemon are also very effective and don’t contain harsh chemicals. Plus, they’re inexpensive to make and you probably have all of the ingredients at home already! In a reusable spray bottle, first mix the castile soap with the water and then add the vinegar. Adding the soap to a water and vinegar mixture can lead to curdling, so be sure to add the vinegar last. Baking soda alone is an effective scouring powder for ovens, stovetops, bathtubs, sinks and toilets. For tougher grime that requires a more abrasive powder, add some seat salt to the baking powder. For a paste that is easier to wash away than straight powder mix the baking soda with a few drops of castile soap until you reach a smooth, paste-like consistency. For a complete list of homemade cleaners and ingredients click here and here. Asthma prevention begins at home. It’s important to know where asthma triggers may be hiding and how to thoroughly clean your home to prevent asthma attacks. Cleaning practices such as vacuuming once a week and washing bedding in hot water can help eliminate triggers. This video from Hurley Medical Center explains how to asthma proof your home! What are your tried-and-true methods for asthma proofing your home? Share them with us!